Working out in the gym is great and all that, but it can’t compare to the fresh air outside and the beauty of nature. 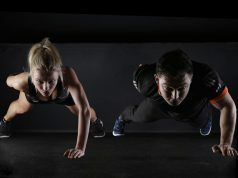 Unfortunately, though, it seems as if many of the most popular outdoor activities include mostly cardio such as cycling and running – and those parkour people jumping off buildings, but that’s not for everyone. There are, however, a lot of different types of climbing and you might want to look into bouldering, free climbing and solo climbing before you get started. It helps a bit to read up on the different types to figure out which one is the best fit for you – and to understand which climbing gear you might have to invest in. You can have a look at this article to read more about what you should know before you get started – but a good tip is to remember to paddle with your whole body and not just your arms. It will make sense soon enough when your arms start to ache, though, but keep it in mind and your whole body will get a much better exercise.